Roker Marine bowler Peter Thomson progressed in the Champion of Champions competition. The county championships have reached the dreaded semi-final stages. With a place in the county final at stake, and the much sought after place at the national championships, it is the hardest round to lose. It has been a decent week for local hopes, though. Silksworth’s David Bolt remains on course for a fourth county singles title after defeating Dunston’s Alex Bryden 21-15, fighting back strongly after trailing 8-0. In the final, Bolt will face either Dairy Lane’s Mal Peach or Darlington RA youngster Liam Macey. Roker Marine hosted one of the pairs semi-finals, which resulted in more good news as the Dairy Lane duo of Ken Briscoe and John Thurlbeck ground out a 22-18 win over Stockton’s Mark Hodgson. In the final, Thurlbeck will face the 2016 county champions, Michael English and George Williams of Dipton, who convincingly saw off Vince Rewcastle (Darlington RA) 20-8 at Dairy Lane. There was mixed news for Silksworth in the fours semi-finals. Jack Deverson, Stevie Cairns, Paul Sainthouse and Josh Halcrow suffered heartache, going down 19-18 to the defending county champion, Leadgate’s Garry Robson. However, the 2014 national champions – Phil Dixon, Neal Ridley, Ian Riches and David Bolt – booked their final place with a 19-14 victory over Darlington RA’s Tony Macey. The finals will be held at Dairy Lane next Sunday, July 29. Due to the low number of entries, only the winners of the Under-25 Pairs county final will secure a place at Leamington Spa. In the semi-final at Pelton Fell, the Silksworth duo of Jaxon McKenna and Josh Halcrow booked a final spot with a 26-19 win over Spennymoor’s Matthew Gleeson. They now tackle the defending champions, Darlington RA’s Keith Burton and Liam Macey, in the final. The George Turley Champion of Champions singles competition, named after the legendary Hartlepool and England player, sadly doesn’t progress any further than the county final. However, there will be local interest in this year’s final. Roker Marine’s Peter Thomson secured his place with a hard-fought 21-16 win over Hundens’ Jason Taylor. In the final, Thomson will face Dunston’s Alan Jobling, who defeated Darlington South Park’s Simon Brodie 21-10. The various Bowls England competitions are carrying on apace. Silksworth’s run in the Top Club continues after an impressive 4-1 win over Silloth at Appleby. That sets up a cracking tie away to Darlington RA, who beat Nafferton 3-2 at Dunnington. There was disappointment for Houghton Dairy Lane’s Glynis Morgan, who missed out on a trip to Leamington Spa in the senior singles after going down 21-18 away to Darlington North Park’s Jane Pattison. There was, however, better news for Morgan, who, alongside Joan Rodgerson, booked a place at Leamington in the senior pairs, albeit with a walkover against Darlington Woodland’s Ann Anderson. The Durham County ladies’ Stella Logan squad may have lost their opening four group games, but they have run into a bit of form. They completed back-to-back wins with a hard-fought 117-111 success against Northumberland at Stockton. Houghton Dairy Lane’s Margaret Metcalfe steered Maine Tuffnell (Newton Hall), Nicole Kirtland (Darlington North Park) and Liz Morris (Horden) to a match-winning 31-11 victory. Across the green, Durham won on three of the six rinks. 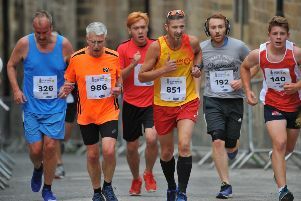 Shildon skip Esther Helm’s quartet, which included Sunderland’s Charlotte Bayliss at second, got home 16-13 and Stockton’s Josie Hodgson’s quartet, with Dairy Lane’s Jackalyn Classen at lead, ran out 26-11 winners. Points-wise, it was 7-3 in Durham’s favour, lifting them off the foot of the table. There is a break now until late August, when a trip to Southport beckons as Lancashire provide the opposition. The ladies’ A team are in action today as they face Northumberland at Ashbrooke. Despite only one win in four games so far, the Durham squad still have an outside chance of snatching the Northern Trophy, but they will need a big win today before heading to Cumbria in late August. There is top-class Middleton Cup action at Silksworth (2pm) tomorrow as Cumbria and Yorkshire go head to head in the quarter-finals. Any misconceptions that the sport is a quiet and gentile affair will be dispelled in what should be three hours of sporting drama.